you have revealed them to the childlike." The Catechesis of the Good Shepherd is a distinct approach to catechesis, through which the youngest children build deep, lifelong relationships with Christ and His Church. 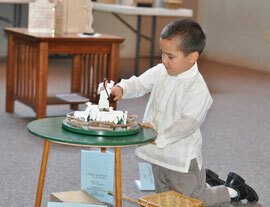 Originating in Rome in the 1950s, the Catechesis of the Good Shepherd uses a rich Montessori approach to engage children as young as 2 1/2 in age-appropriate, hands-on materials, based on Sacred Scripture and the Liturgy. Because it engages children so profoundly, it has become the best approach to young children's catechesis in a growing number of dioceses, parishes and schools around the U.S and the world, including here in the Diocese of Sacramento. Cenacle Resources is a nonprofit 501(c)(3) organization that supports the development of the Catechesis of the Good Shepherd in parishes and schools in the diocese. It also offers Catechesis to children up to age 12 through affiliation with the Cathedral of the Blessed Sacrament. In 2018-19, we have families from over 20 different parishes in five counties enrolled. Although Cenacle Resources is not a diocesan agency, its board members and catechists pledge fidelity to the Magisterium and to the Bishop of Sacramento. To hear interviews about CGS on Immaculate Heart Radio, click here for the 8/26/2015 interview, or click here for the 2/26/2014 interview. To view a short video about CGS, just click the screen below.